DO-86460-03 was succesfully added to your cart. This meter has a 4-ft. ribbon micro-cable that allows you to place the probe within an area and close the door without affecting the probe or the door seal. Accurately monitor temperature within freezers, water baths, heating blocks, incubators, refrigerators, and other areas. 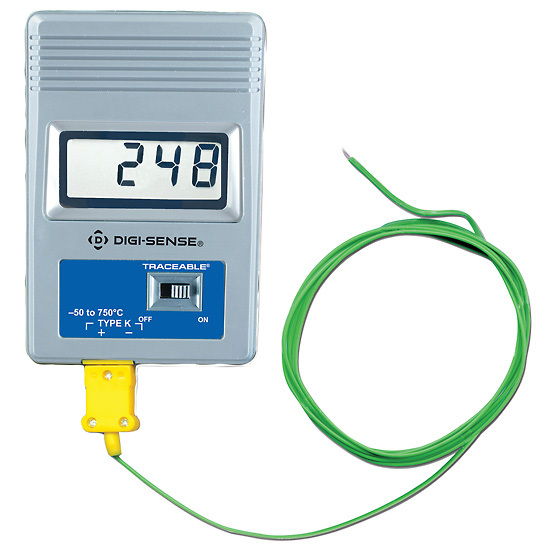 The meter includes a fast-response type-K probe that can be used for general purpose applications. Users can also choose from a wide verity of probe sold separately for surface, liquid, air or semi-solid materials.Digital thermometers are inexpensive, easy-to-use instruments that display temperature in a fast-responding digital format. Digital thermometers come in pocket-sized, remote, wall, panel-mount and even tabletop versions. They typically have a stainless steel probe sheath with thermistor or diode sensor. Probes can have varying lengths and are even equipped with extension cables for difficult to access temperature measurement. Wireless thermometers are also available for remote digital temperature monitoring. NSF-approved thermometers are waterproof to allow complete sanitization and some even add antimicrobial protection. Pocket thermometers usually require a battery but are available solar-powered for temperature monitoring over an extended period of time. Dual-channel indicators can provide indoor/outdoor comparisons while min/max thermometers give a digital readout of highest and lowest temperatures read. Davis Instruments features general purpose digital thermometers from trusted brands including Extech, Taylor, Cole-Parmer, Oakton, Testo, and Comark. For more information about digital thermometers contact a Davis Application Specialist today. one beaded-wire type K probe, NIST traceble report by manufacturer, leatherette case, and one 9 V battery. Dimensions 2.75 in W x 4.25 in H X 0.75” (76 x 114 x 18mm). Does this display degrees Fahrenheit or Celsius? This item displays in Fahrenheit. If you are looking for the Celsius version, that is item number 86460-05. Does this product come with the Prob ? or do I have to buy a metal probe individually? I want to take temperature measurements inside a vessel so I need atleast 10 cm in length metal Probe. One beaded-wire type K probe is included. See the 08439-62 which has a 316 Stainless Steel shaft and a length of 4.5" or 11.4 cm. I just received my # 86460-03 with a 20 ft extension and stock probe. Normally a probe with a bulb reads at the bulb and not from the cable but this is just a very thin cable. So the question is : does the full length of the probe read or just the tip. If the entire wire picked up temperature and you pass it through a gasket or a hole in theory you would be reading a combination of two environments. This is a thermocouple type thermometer. The temperature reads at the end of the probe where the tip is exposed. The temperature along the wire will not affect the measurements. I need a 12 ft. lead. Is this possible and how much more? A 10 foot extension cable can be ordered under 08516-30. Otherwise, the 08516-82 can be ordered as an alternative. This unit uses a mini connector to connect the probe. This unit includes a bead wire probe, which is very thin and will probably work for this application. We also have self adhesive probes that may work as well. It is item number 08519-52. I would like to use the probe in a thaw bath that is in the 80 F temp range, but would also have up to 200 ppm of chlorine in solution. Will the probe that comes with the thermometer be resistant to corrosion in this environment? The included probe would not be the best as it has an exposed junction and is not recommended for fluids. The 08466-82 has a PTFE coated junction with a FEP insulated cable. I am looking for a meter and probe to measure the temperature inside our Sub-arc flux oven. I need to measure the temperature at two points (250°F and 550°F) with the oven door closed; will the ribbon cable withstand those temperatures? The maximum temperature for the included sensor is 482 °F (250 °C), with short term usage to 572 °F (300 °C), however, a different probe is needed for the constant exposure to high temperatures. I would recommend part number: 08467-24, which comes with attached miniconnector. I am interested in this for monitoring water temp on an outdoor boiler. Is there a wireless version so i can monitor from inside my house? There is a different version which is wireless: 94460-78. Does the unit have a auto shutdown feature,and if not what is the battery life if the unit is left on? This unit will remain on until the power switch is set to the off position. The battery life is dependent on the environment that it is in, but expect a long life per battery. I would like to use this in my oven to monitor the temperature, without having to open the door. How quickly does the thermometer respond to temperature changes, and how could I attach it properly inside the oven? Thank you. The probe can be attached to a wall using a steel cable strap, taking care not to damage the insulation. We do have a specialty surface mount probe for ovens, item 08468-22, that features an alligator clip for attachment to objects inside ovens, and it has a response time of 60 seconds. The beaded wire probe that is included with the meter does not have a published response time, but it is a fast response beaded wire type K, so the response time for this would be approximately the same to reach 99% of a new measurement. Speedy check out, fast delivery, and thermometer works great for our needs in the aviation business. Great little product for the price..
Nice little instrument for the price, NIST certified included... can't go wrong with this! I used this to monitor water temperature for a geothermal heating system. It was priced right and seems accurate and reproducible enough for this application. I am having trouble with my GE double wall ovens. GE sent a technician out to check it out. He had a measuring device with a wire probe that he positioned in the middle of the oven to record the temperature. He didn't fix the problem. To document the weird things that are occurring, I needed a thermometer to show the actual oven temperature. This thermometer seemed to the best fit for my needs. It lets me know the actual oven temperature which is the reason I bought it. The bead probe weld quality control needs improved. Accurately measures water temperature, to & from cooling coils in my machines. Verifies accuracy or malfunction of guages. This is a good straightforward no-frills digital thermometer. Uses a type K thermocouple to sense temperature so, unlike most other types I have tried you can submerge the probe in hot water. Makes the others seem silly. Add the NIST certification so you can use it in your ISO-registered lab and for less than $50 you have a winner. I was looking for a simple high temperature thermometer that was reasonably accurate and inexpensive. This one is just perfect. One switch (on/off) and it comes with a high temperature probe - just what I was looking for and very inexpensive too. Reads 3 F high. No way to calibrate this item. Headline says it all...simple, effective, inexpensive! Use it to monitor temperature of experimental set-up over the course of hours.